For reasons unknown to me as of this writing, I am unable to upload pictures of the kids to the Google blog account. And that really bugs me because I've got some great photos. My $i$ter in law made some incredibly cute blankets for the kids -- she even put a "Bonddog" in the corner of each blanket with each dogs name. So basically, I'm whetting your appetite for these pictures as soon as I can figure out why they're not uploading. So until Monday, have a good and safe weekend. "As a result, this recession looks to be longer and more severe than originally forecast. Still, there are indications that the second half of the year will show improvement," he said. Lower energy prices and concerted monetary and fiscal policy efforts should set the stage for a recovery later in 2009, he said. "Energy prices have fallen dramatically, making it much less expensive to drive cars or heat homes," he said, "Fiscal stimulus packages being discussed in Washington could provide an economic boost. And monetary policy is also contributing," he added. The Federal Reserve last month cut its benchmark fed funds rate to a range of zero to 0.25 percent after an aggressive rate cutting cycle and has rolled out a raft of unprecedented liquidity programs to support key credit markets in its effort to battle the worst financial crisis in 80 years. "While all these developments will take time to fully impact the economy, they should be sowing the seeds of a recovery later in 2009," he said. A lot of us are banking on the fiscal program to really help ameliorate the damage in the second half of next year. The Fed president also makes a strong case about lower energy prices having a net positive effect. Then there is the issue of monetary policy. In general it takes 12-18 months for interest rates to move through the economy. Assuming we are still in a time when that is an appropriate analysis (and we may not be), the impact of lower rates will be hitting the economy all next year. Assuming all of this to be accurate and the second half of next year will be OK but not great. This is the scenario that I think is most likely, but there are a lot of ifs that have to happen for that work. Nonfarm payroll employment declined sharply in December, and the unemployment rate rose from 6.8 to 7.2 percent, the Bureau of Labor Statistics of the U.S. Department of Labor reported today. 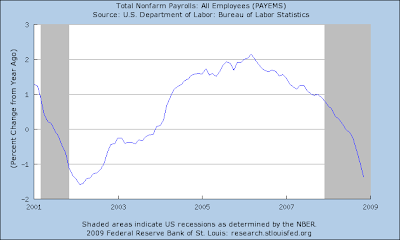 Payroll employment fell by 524,000 over the month and by 1.9 million over the last 4 months of 2008. In December, job losses were large and widespread across most major industry sectors. There is no good news in this report; it is uniformly bad across all sectors and areas. Another important indicator of labor market difficulty, the number of persons working part time for economic reasons, has suggested a softening in the demand for labor since about mid-2006. Sometimes referred to as involuntary part-time workers and viewed as underemployed, these individuals wanted full-time jobs but worked less than 35 hours during the survey reference week primarily due to slack work (a reduction in hours in response to unfavorable business conditions) or the inability to find full-time work. In November 2008, 7.3 million persons were employed part time for economic reasons, up by 3.4 million from a recent low of 3.9 million in April 2006. And in one of the greatest ironies of all, the BLS added 72,000 jobs to this report thanks to the birth death model. The U.S. Treasury has failed to reveal its strategy for stabilizing the financial system, not answered questions asked by a government watchdog, and has done nothing to help struggling homeowners, a report being released Friday charges. In the most scathing criticism yet of Treasury's implementation of the $700 billion financial-rescue package, a draft report being issued by the five-member congressional oversight panel said there appear to be "significant gaps" in Treasury's ability to track hundreds of billions of dollars of taxpayer money. "The panel's initial concerns about the [Troubled Asset Relief Program] have only grown, exacerbated by the shifting explanations of its purposes and the tools used by Treasury," said the draft report, which found that the department has "not yet explained its strategy" for stabilizing the financial markets. 1. )The U.S. Treasury has failed to reveal its strategy for stabilizing the financial system: True, but there's a reason for that: the Treasury's rationale has been changing. First they were going to buy troubled assets, then they injected capital into the banks. The bottom line is the second option -- injecting capital -- was a far better idea. But it was the Treasury's second choice. And don't be surprised if a third option emerges and is debated. 2.) not answered questions asked by a government watchdog: Big problem for which there is no defense. If you get taxpayer money, you answer taxpayer questions. 3.) and has done nothing to help struggling homeowners: my understanding was this was not part of the TARP's original plan. I could be wrong (and if I am please let me know), as the initial bill was passed quickly with the usual "shove this in at the last minute" mentality. That's not to say nothing should be done, because this is at the heart of the problem the US economy is facing right now. 4.) having no ability to ensure banks lend the money they have received from the government: news flash: loan issuance drops during a recession. In addition, according to the latest Quarterly Banking Profile from the FDIC banks are really struggling meaning loan issuance isn't a high priority right now. 5.) 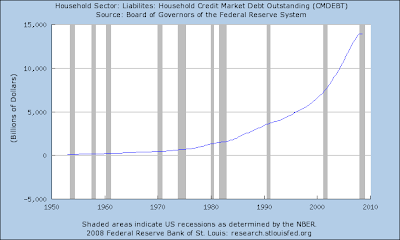 having no standards for measuring the success of the program: The US financial system is still living and breathing. That makes it a success. Let me back up a bit. I think what the Treasury was originally trying to do was prevent a systemic meltdown -- like the one that started the Great Depression. Their primary objective was to prevent a wave of failures and collapses that would paralyze the economy and send really painful ripples around the globe. And in that, so far, we've succeeded. I think an emergency room analogy is appropriate. The person came in after a car wreck caused by a DUI. This is not the appropriate time to lecture them on the dangers of what they did. Instead it is the time to stabilize the body and get it into surgery. And to hope that this would somehow lead to an increase in loans in the middle of a recession where banks are in the process of writing down asset values is a misplaced fantasy. That wasn't going to happen with the money. The lack of communication with Congress about what is happening is wrong. There is no defense for it. So -- what should happen with the money? All of the government money received should be placed in a separate account at the bank. It should first be used to stabilize that bank, for example, if the bank has to increase its loan loss reserves or has to write down the value of assets. The bank should be able to use the money to buy a distressed institution so long as the merger will not cause the buying institution to become distressed. In addition, the bank should suspend all dividend payments and bonuses for all employees. This is an emergency -- and in an emergency everybody tightens their belt. Bottom line: there is a lot of conflicting information on this chart. 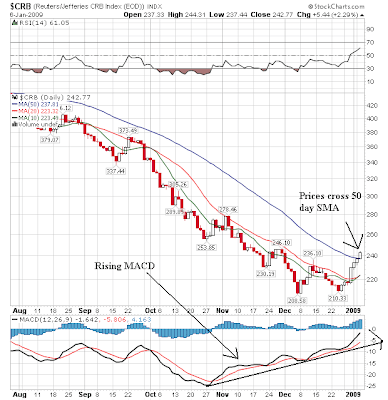 -- Prices are right at the 10 day SMA. They have sold-off are a nice rally. -- The 20 day SMA is above the 50 day SMA, but the SMA is now moving sideways. The number of Americans collecting unemployment benefits surged to a 26-year high as the labor market worsened in a yearlong recession. Initial jobless claims unexpectedly fell by 24,000 to 467,000 in the week that ended Jan. 3, the lowest level in almost three months, the Labor Department said today in Washington. The total number of people getting benefits rose a week earlier to 4.6 million, the most since 1982. While the government projects a surge in firings in late December and early January, job cuts may have come earlier last year as sinking sales and the worst credit conditions in seven decades forced companies such as General Motors Corp. and Chrysler LLC to pare costs. The claims report came as President- elect Barack Obama warned the U.S. risks sinking deeper into an economic crisis without a stimulus package of about $775 billion. However, I still think (maybe it's a wild hope) that we're in the absolute worst part of the storm right now. I am hoping it will get better by the end of the second quarter. Retailers' sales slumped in December, with even Wal-Mart Stores Inc. bending to economic realities by cutting its earnings expectations for the current quarter. Other U.S. retailers also cut their outlooks, including Gap Inc., Pacific Sunwear of California Inc., Macy's Inc. and Ulta Salon, Cosmetics & Fragrance Inc. Retailers' November results were terrible, made worse by the fact that the timing of Thanksgiving last year pushed some post-holiday sales into December. But the spillover did little to bolster December's numbers. Wal-Mart, which has benefited from bargain-hunting in a weak economy, reported that for its US. stores open at least a year sales, excluding gasoline, grew 1.7% last month amid a 1.9% increase at its namesake chain and 0.1% rise at Sam's Club. 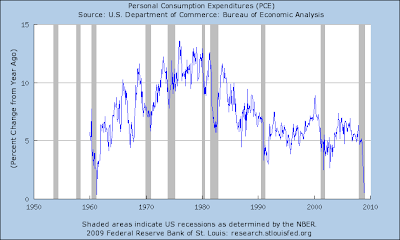 Real personal consumption expenditures (PCE) fell for the fifth straight month in October, with the slowdown evident in nearly all broad spending categories. Sales of light motor vehicles, which slumped in October, fell further in November, but the available information on retail sales suggested a small increase in real outlays for other consumer goods. The annualized three-month change in spending on services in October was just one-third of the rate registered in the first half of 2008. Preliminary data for October and November suggested that overall fourth-quarter real spending would receive a modest boost from recent price declines for gasoline. Real incomes were also boosted by the reversal in energy prices, though the negative wealth effects of continued declines in equity and house prices likely offset this somewhat. Measures of consumer sentiment released in November and December remained low, and available evidence suggested further tightening in consumer credit conditions in recent months. -- Prices are below the 50 day SMA, just moved through the 20 day SMA and are resting on the 10 day SMA. That's a big technical move for one day -- especially with such a large bar. 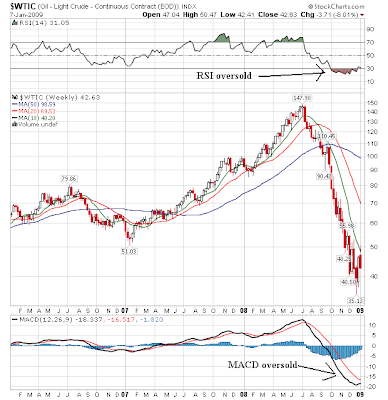 -- The RSI is dropping. Or more specifically -- yesterday's markets. On the daily 5 minute chart, note prices have almost fallen to the 50% Fibonacci retracement level. I'm writing this from my IPhone and obviously can't get to a computer. I'll post the market recap in the morning. Economic activity in most advanced foreign economies contracted in the third quarter, driven by sharp declines in investment and by significant negative contributions of net exports, as the global recession took hold more strongly. Incoming data pointed to an even weaker pace of activity in the fourth quarter. In Canada, however, real gross domestic product (GDP) increased at a faster-than-expected pace in the third quarter, though consumption and investment continued to soften. In the euro area and the United Kingdom, purchasing managers indexes fell in November to levels associated with severe contractions in economic activity. Labor market conditions in the advanced economies deteriorated further, with most countries experiencing rising unemployment rates. In Japan, real GDP fell in the third quarter as domestic demand declined and private investment fell for the second consecutive quarter. After peaking in the third quarter, consumer price inflation moderated in all advanced foreign economies, primarily as a result of falling energy and food prices. Economic activity in most emerging market economies decelerated sharply in the third quarter, though a surge in agricultural output helped to support activity in Mexico, and the Brazilian economy continued to expand rapidly. In Asia, output decelerated significantly, as the pace of real activity moderated in China and several other economies saw declines in real GDP. Recent readings on production, sales, and exports suggest that emerging market economies weakened further in the current quarter. Headline inflation generally declined across emerging market economies, primarily because of lower food and energy prices and, in some cases, weaker economic activity. Alcoa Inc. announced the elimination of about 15,000 jobs, more plant closures, plans to sell assets and a 50% cut in capital expenditures to contend with the sustained recession. The moves raise the question of whether other companies that have cut costs also will feel the need to dig deeper. Alcoa, the world's largest aluminum producer, announced a round of cost cutting in October when demand for commodities and the availability of credit began to fall. The combined restructuring will result in a fourth-quarter charge of $900 million to $950 million, or $1.13 to $1.19 a share. The company expects to report fourth-quarter earnings next week. Alcoa earned $632 million, or 75 cents a share, in the fourth quarter of 2007. "Many of these things are painful and many of these things are drastic," Alcoa Chief Executive Klaus Kleinfeld said in an interview Tuesday. "We will continue to monitor the dynamic market situation to ensure that we adjust capacity to meet any future changes in demand and seize new opportunities. My theory right now is that companies are getting the pain out of the way now after a terrible year. Note this will cause a 4th quarter charge -- a charge at the end of a long and painful fiscal year. However, a contrary view would be, "isn't there a big stimulus bill coming down the pike? Shouldn't that help a company that works with raw materials?" The labor market continued to worsen. According to the November employment report, payroll employment fell at a rapid pace over the preceding three months, with substantial losses across a wide range of industry groups, including manufacturing, construction, retail, financial activities, and business services. Indicators of hiring plans also dropped steeply in November, and other labor market indicators suggested that jobs remained in short supply. The unemployment rate climbed to 6.7 percent in November, while the labor force participation rate fell after remaining steady for much of the year. New claims for unemployment insurance rose sharply through early December. 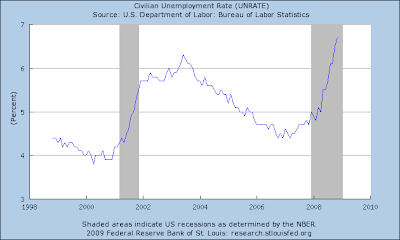 the unemployment rate has been increasing for about two years. Industrial production, excluding special hurricane- and strike-related effects, fell markedly in November after sizable declines in the preceding two months. The recent contraction in industrial output was broadly based. The steep pace of decline in the production of consumer goods reflected not only cutbacks in motor vehicle assemblies but also drops in the output of other goods, such as appliances, furniture, and products related to home improvement. The production of business equipment was held down by declines in the output of both industrial and high-tech equipment. The output of construction supplies extended its decline after a brief pause in the middle of the year, and the contraction in the production of materials intensified. In particular, steel production plummeted, and the output of organic chemicals contracted noticeably. For most major industry groups, factory utilization rates declined relative to their levels in July and remained below their long-run averages. Available forward-looking indicators pointed to a significant downturn in manufacturing output in coming months. 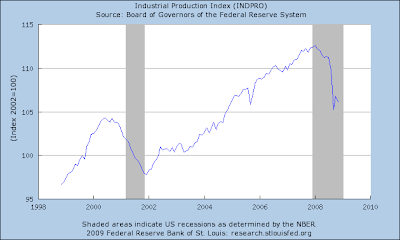 Industrial production has been dropping for most of the year and is currently "cliff diving". 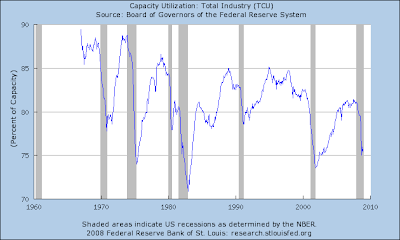 Capacity utilization is also dropping. This means that when the economy starts back-up there will be a dearth of investment as companies seek to first utilize capacity that lay idle. Consumers are closing their wallets big time. 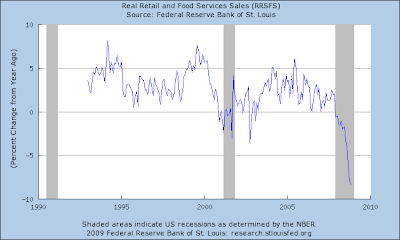 Broader consumer spending is also dropping. Housing demand remained weak, and although the number of unsold new single-family homes continued to move lower, inventories remained elevated relative to the current pace of sales. Sales of existing single-family homes changed little, although a drop in pending home sales in October pointed to further declines in the near term. 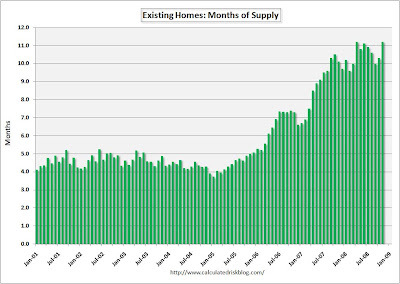 Housing has been a mess for a few years and there is no indication that will change soon. 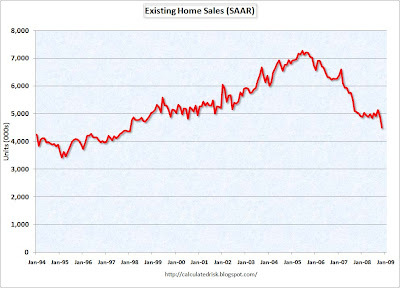 Sales evened out for most of 2008 but took a big drop last month. 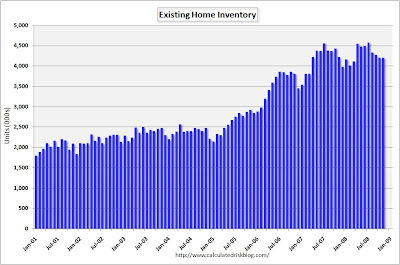 The number of months it would take to clear existing inventories at the current sales pace has been between 10 and 11 months for the last 6 months. Home prices in 20 major U.S. cities declined at the fastest rate on record, depressed by mounting foreclosures and slumping sales. 3.) Industrial production will remain at depressed levels. Bottom line: this chart looks like it is turning around. 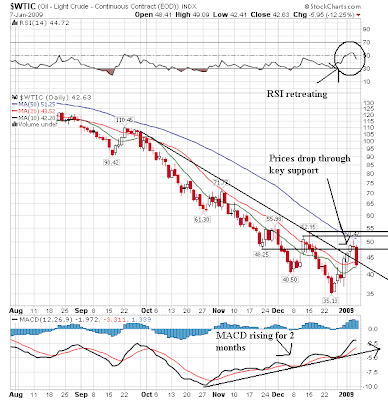 -- After rising through downside resistance, prices have been mellow for the last few days. Purchases at U.S. retailers declined last week as post-Christmas markdowns failed to overcome what may have been the worst holiday shopping season in four decades. Sales at stores open at least a year dropped 0.8 percent in the seven days through Jan. 3, the International Council of Shopping Centers and Goldman Sachs Group Inc. said today in a statement. ICSC Chief Economist Michael Niemira said November- December sales declined as much as 2 percent. Macy’s Inc., Talbots Inc., Aeropostale Inc. and other retailers offered discounts of 65 percent or more on some sweaters, jewelry and pants to clear out merchandise after Christmas. Higher markdowns may put more pressure on earnings. This shouldn't be a surprise to anyone; the economy is in a recession after all. But the charts of the actual sales data are downright scary. 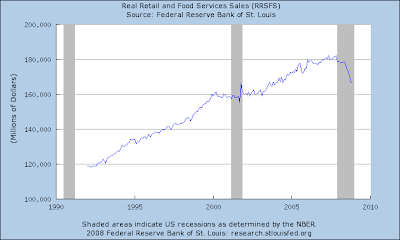 Above is a graph of real retail sales. Note the cliff diving that is now occurring. 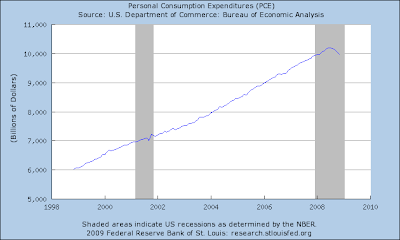 How Long Can Non-Residential Spending Hold-Up? Residential spending fell at a 4.1% rate in November to $336.3 billion, 22.8% lower than November 2007. Despite the credit crunch and worsening economy, nonresidential spending showed surprising resilience, rising 1% during the month to $742.1 billion, up 9.2% from the previous year. That does not bode well for the coming year. This is a video I did for a show called "Meet the Bloggers." 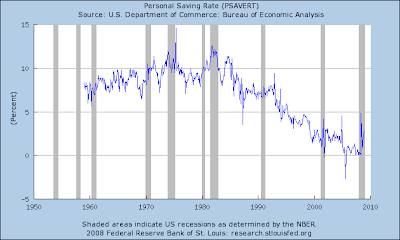 It highlights one of the central problems of the US economy: we consume at massive rates at the expense of savings. This chart has been increasing for some time. This number has been increasing since the early 1990s. 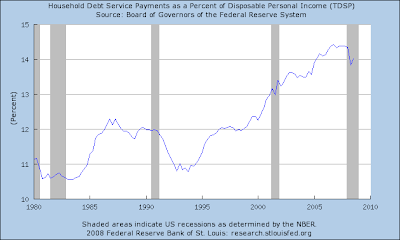 U.S. household debt, which has been growing steadily since the Federal Reserve began tracking it in 1952, declined for the first time in the third quarter of 2008. In the same quarter, U.S. consumer spending growth declined for the first time in 17 years. That has resulted in a rise in the personal saving rate, which the government calculates as the difference between earnings and expenditures. In recent years, as Americans spent more than they earned, the personal saving rate dipped below zero. Economists now expect the rate to rebound to 3% to 5%, or even higher, in 2009, among the sharpest reversals since World War II. Goldman Sachs last week predicted the 2009 saving rate could be as high as 6% to 10%. As savings increase, economists say, spending is likely to contract further. They expect gross domestic product to decline at an annualized rate of at least 5% in the fourth quarter, the biggest drop in a quarter-century. 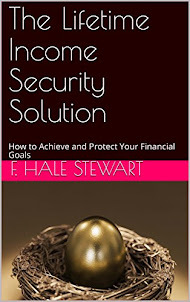 "The idea that the American family will quickly spend us out of this recession is a fantasy. It won't happen," said Elizabeth Warren, a professor of law at Harvard University who last month was named chair of the Congressional oversight panel tasked with overseeing the distribution of the government's Troubled Asset Relief Program funds. The flaw of looking at savings as undercutting spending and deepening a recession is that it looks at the beginning of the down cycle and not what helps bring about the end. As prices of everything from cars to housing fall, the money which has been taken out of wages and put into savings to reduce credit balances is available for purchases. Items get so inexpensive that consumers are drawn back into the market. But, drawing them in depends on their ability to capitalize on weak demand and falling prices. A tax cut and stimulus package will increase that ability geometrically. The trend toward savings may be bad this year, but it may be a salvation in 2010. On the longer end of the curve, notice how prices have moved through both the 10 and 20 day SMA. Also note the strength of the bars and the higher volume on the sell-off. Also note the 10 day SMA has turned lower. On the IEFs note the same technical developments as the TLTs -- prices moved through the 10 and 20 day SMA on higher volume. Also note the 10 day SMA has turned lower. So -- what's the reason for the sell-off? Investors may be glad to see 2008 in the rearview mirror, but in the Treasury market, they already are worrying about 2009. A chief concern is the amount of issuance on tap. Goldman Sachs Group Inc. puts the amount the U.S. government needs to raise at about $2 trillion, including new issuance and rolled-over securities. Goldman said it could be more, depending on the size of the incoming Obama administration's stimulus package. The worry: Just as this onslaught of debt hits, investors could turn their noses at the Treasury market's historic low yields and venture instead into riskier assets. That likely would be even more the case once government programs to kick-start financial markets and the economy gain traction. THE BIGGEST INVESTMENT BUBBLE TODAY may involve one of the safest asset classes: U.S. Treasuries. Yields have plunged to some of the lowest levels since the 1940s as investors, fearful of a sustained global economic downturn and potential deflation, have rushed to purchase government-issued debt. full at maturity, the price of longer-term Treasuries could fall sharply in the interim if yields rise. The 30-year T-bond, for instance, would drop 25% in price if its yield rose to 4.35%, where it stood as recently as Nov. 13. The bear market may have begun Wednesday, when prices of 30-year Treasuries fell 3%. They lost another 3% Friday. 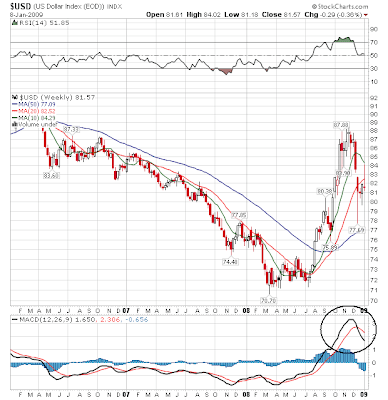 - "Get out of Treasuries. They are very, very expensive," Mohamed El-Erian, chief investment officer of Pacific Investment Management Co., warned recently. Pimco runs the country's largest bond fund, Pimco Total Return (ticker: PTTPX). 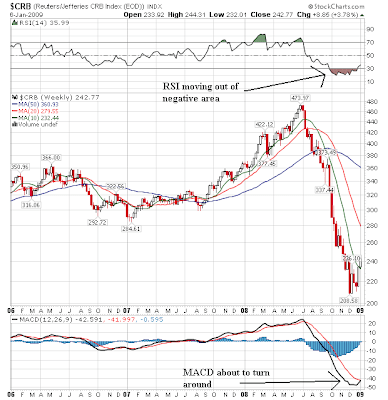 - Treasuries offer little or no margin of safety if the economy unexpectedly strengthens in 2009, or the dollar weakens significantly, or inflation shows signs of reaccelerating. Yields on 30-year Treasuries easily could top 4% by year end. Bottom line: the market wants to rally, but it needs a fundamental reason to do so. I think the markets are waiting for a better read on Washington's policy response. For all of these reasons, I support Marty's conclusion that there is an exceptionally strong case for substantial fiscal stimulus over the next few years. In ordinary circumstances, there are good reasons why monetary, rather than fiscal policy, should be used for stabilization purposes. But these are exceptional circumstances, and fiscal policy can help get the economy going. If ever, in my professional career, there was a time for active, discretionary fiscal stimulus, it is now. Although our economy is resilient and has bounced back quickly from downturns in the past, the financial and economic firestorm we face today poses a serious risk of an extended period of stagnation—a very grim outcome. Such stagnation would intensify financial market strains, exacerbating the problems that triggered the downturn. It's worth pulling out all the stops to ensure those outcomes don't occur. In the post below, we learned that global manufacturing activity is dropping like a stone. However, according to manufacturing industry stock charts, traders are anticipating a rebound in this sector. The charts below are from Prophet.net. Notice that on the overall manufacturing index prices sold-off hard at the end of last year but have since rallied through resistance. 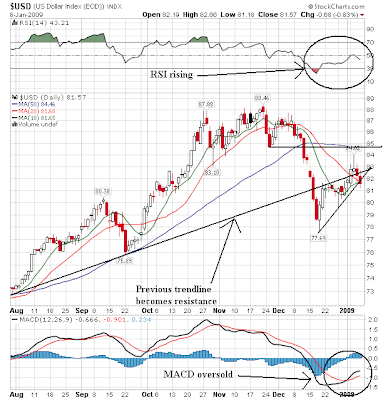 Farm and construction is rebounding and is approaching the 50 week SMA. Diversified machinery has also broken through resistance levels. Machine tools are already bouncing back. Metal fabrication formed a reverse head and shoulders pattern and appears ready to move through the pattern's neckline. Pollution treatment machinery has moved through key resistance levels as well. Small tools stocks have moved through key resistance levels as well. Traders are speculating there will be a big stimulus bill that will help all of these stocks -- at least that's my assumption.